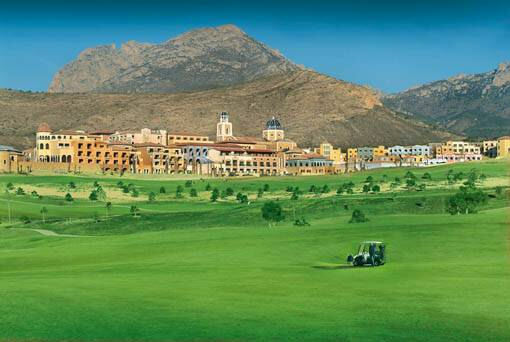 Spain’s Costa Blanca is a fabulous location for Golf holidays with dozens of golf courses for all levels of player. Driving ranges, practice greens and championship courses some of which are ranked among the top courses in the world and all within easy reach of Casa de Sueños family holiday letting. Below are some of the most popular golf courses on the Costa Blanca with course information, location and facilities. Note that to avoid disappointment you should always book your golf in advance, especially during high season. Formerly known as Real de Faula, the Villaitana has two 18 hole golf courses designed by Jack Nicklaus in a Mediterranean village styled resort complete with health spa, tennis courts, restaurants and much more. 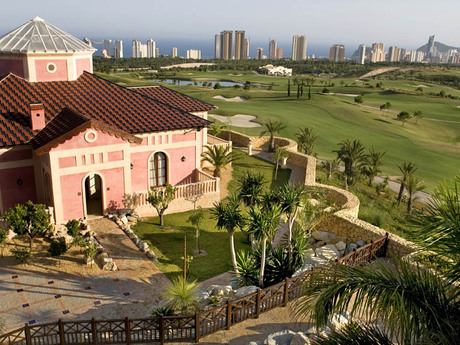 Located on a hill side overlooking Benidorm with stunning panoramic views of the Bay of Marina Baixa to the south and the rugged Puig Campana mountains to the north, this is one of the best known golf courses around the Costa Blanca. The resort, designed by the Spanish architect Andrés Piñeiro, provides a world of relaxation and a new concept in luxury on the Costa Blanca. The facilities at the Villaitana Golf include a driving range, various practice areas for putting and bunker shots, a Club House with stunning views, cafeteria, pro-shop, and an excellent golf school. The Health Spa offers a wide range of holistic and non invasive treatments tailored to the needs of each individual client with highly qualified staff. This American styled course is more than 6,612 metres in length and with its narrow fairways, is characteristic of a Nicklaus design, with exquisitely shaped greens. Because the course is not located within any urban development you can enjoy your golf in completely natural surroundings with stunning views over the Mediterranean Sea and the mountains of Finestrat. This is a fun course for golfers of all levels. It is 3,858 metres in length and is located on the hill side of a Mediterranean pine forest. Its design provides a great golfing experience for all types of players independent of their handicap. Although shorter it is still exciting as all the holes offer alternatives for medium and high handicapped players. Sierra Cortina 18 hole Pitch & Putt is ideal for beginners and for the seasoned golf pro. The fairways range in length from 55 metres to 100 metres with two artificial lakes and magnificent greens making it a pleasure to play. Beginners are able to play the short game after having just a few classes without having to necessarily achieve the official handicap, while experienced players are able to tackle the full course with different hazards. Sierra Cortina facilities include Short Game and Practice Range, Golf School, Club House and Cafeteria, Club rental and buggies, Pro Shop, Car Park, Open all year round. Sierra Cortina also has a sports centre and health spa boasting gym, tennis, sauna, holistic treatments. For the perfect place to stay for your golf holiday in the Costa Blanca, see: Villa Availability.